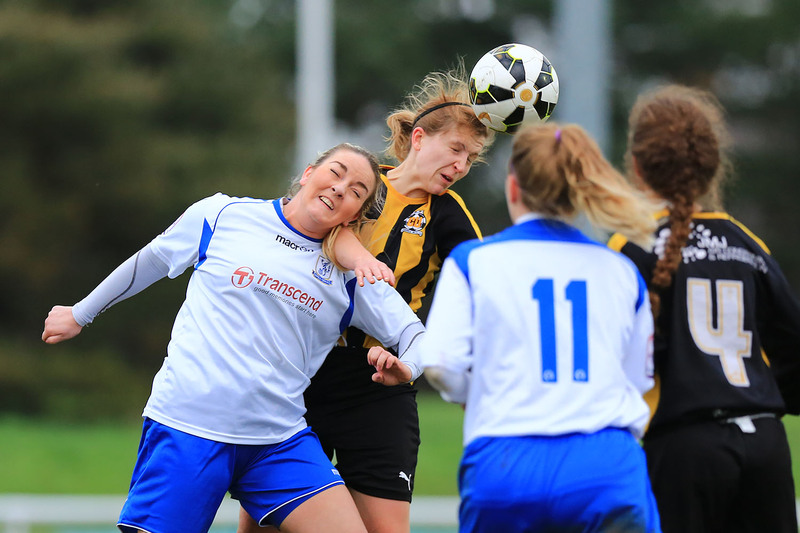 The A10 derby is the featured match on the Supporting Women's Football Blog this Sunday a match from the FAWPL South East Division One, Enfield Town Ladies v Cambridge United WFC. A recently rearranged fixture, with the awful weather at the end of 2015 and the beginning of 2016 wreaking havoc with the fixtures lists meaning alot of teams are still waiting to kick a ball in competitive action. 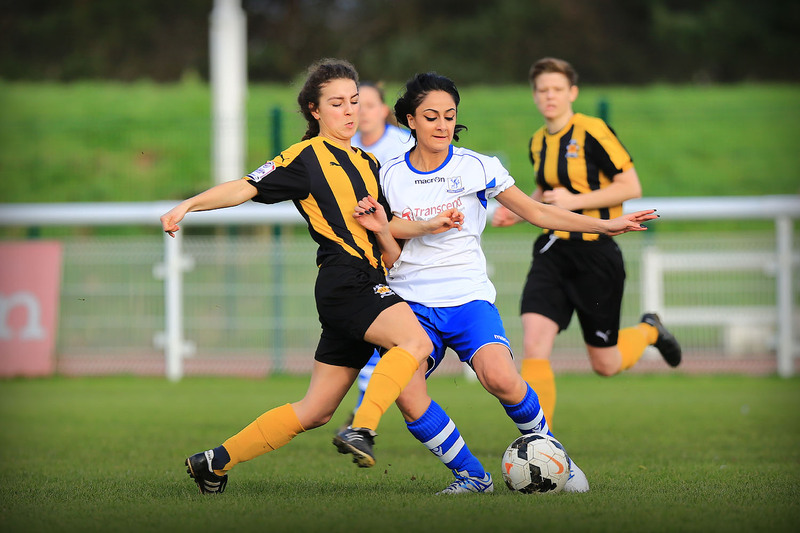 Good news for Enfield Town Ladies who haven't played a match in the league since the 25th October last year! As a result of that have slipped down the league table into 9th place as others around them have played. A single cup match in both November then December but that's it. This their 1st competitive game of 2016, have a record of 3 wins, a draw and 5 losses from 9 league games played, well clear of the relegation battle at the bottom of the table will be looking to climb instead. Cambridge United WFC in comparison have played 15 league matches to date, the 2nd highest in the league. Have recovered strongly from a poor start to the season getting regular games in are on an unbeaten run that stretches 8 matches, 6 wins and 2 draws in that time since mid October. Manager Steve Edwards bringing in strikers Paige Logie along with Sarah Wiltshire on loan from Yeovil Town Ladies, the welsh striker scoring 10 goals in 5 games. 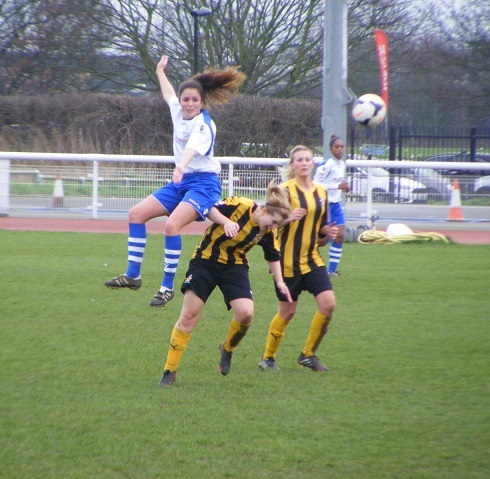 Wiltshire's loan spell has ended, however the club has brought in another player with FAWSL 2 experience on another short term loan basis, Anneka Nuttall from Watford Ladies, to give her competitive minutes on the pitch to help her preparation for the new FAWSL 2 season. The venue for today's match, the Queen Elizabeth II Stadium on Donkey Lane. I missed out on a cheeseburger but compensated with a steak and kidney pie. For once I was fully wrapped up for a miserable winters day, however getting into the stadium it as a lovely bright afternoon, dry and sunny... I'm not complaining mind. Enfield Town Ladies starting XI - Kerrie Marlborough (C), Beth Demery, Jordan Ferdinand, Claire Ford, Holly Brandon, Victoria Lewis, Nuala McKevitt, Ayse Mustafa, Alena Beganovic, Regan Coleman & Chloe Bassett. subs - Sheryce Slater, Cara Newton, Lorraine Mason, Cally Browne & Kate Wilding. Cambridge United WFC starting XI - Verity Crook, Emma Jenkins, Lucy Du Plooy, Laura Bright (C), Kayleigh-Anne Burt, Tahnee Perfect, Hannah Goodchild, Anneka Nuttall, Faith Hewitt, Isabella Simmons & Paige Logie. 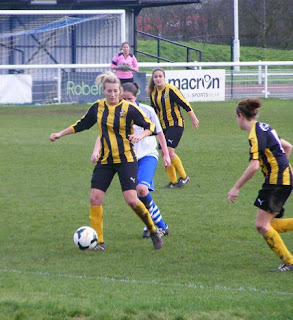 subs - Liz Pamplin, Laura Baker & Becky Taylor. Enfield kick off the 1st half wearing white shirts, blue shorts with blue and white hooped socks with Cambridge lined up opposite wearing amber and black vertical striped shirts, black shorts and amber socks. Enfield concede an early free kick in the centre of midfield as Anneka Nuttall looks to get on the ball bring in forwards, gets tripped. Cambridge captain Laura Bright to take sends the ball long towards the far post with Nuttall the player looking to get on the end of it, can't get a telling touch however wins a corner as the ball takes a knick off the defender sliding in with her. Swung in from the right the corner clears the crowd gathered at the near post is headed behind for a 2nd corner by Enfield's Claire Ford. This corner is played in form the right by Nuttall, Bright gets the touch near post lays the ball back out to Nuttall, wide right she goes for the shot aiming near post, Enfield goalkeeper and captain Kerrie Marlborough is across to cover and hold on to the shot. Both sides look to test the flanks early on, Isabella Simmons down the right for Cambridge on a couple of occasions as Bright looks to play her into space, whilst on that same side on the left for Enfield, Chloe Bassett looks to drive with the ball down the wing Cambridge right back Emma Jenkins keeping with her makes the tackle to win a goal kick off Bassett as they race to the byline. A few rash challenges about, players lunging in, free kicks being given away, Cambridge have another just inside the Enfield half, Bright takes it early sending the ball long into space on the left, Faith Hewitt gives chase and getting her foot on the ball left of the box has Hannah Goodchild making up the ground to support her, passing the ball into her Goodchild turns and sends her pass into Paige Logie coming towards the ball at the near post inside the six yard box, has Ford at her back the central defender putting in a good tackle to prevent her turning for a shot. Enfield are competing with Cambridge for the ball, but not getting it into their opponents box, Victoria Lewis changes that with a great long range pass looking for the run of Regan Coleman coming in from the right, she can't get there but forces Cambridge to concede a corner, from the right swung in centrally, is a firm header by Cambridge's Kayleigh-Anne Burt to send the ball out of the area. Driving with the ball at her feet deep into the Enfield half Hewitt wins a throw for Cambridge, level with the face of the box, the ball is played across the middle into Simmons 20 yards out wants to drive forwards attack the box, shifts the ball a couple to times too many white shirts in front of her Logie is available to her left prods the ball out to her a couple of yards inside the box Logie can see the ball into her leans back as she hits the shot looking to send it high loop over the keeper, the shot is just over the bar too. Goodchild steals in on the ball on half way as Enfield look to bring it out, moving forwards with the ball, Simmons is available on the right side Goodchild attempts to play her in sending the ball into the area, Marlborough is alert to the threat and off her line quickly coming out sliding in to claim. Cambridge continue to make progress on the right side from a throw Jenkins gets furthest forwards carries the ball into the box, Jordan Ferdinand gets back to put in the challenge concede a corner. Played into the near post from the right Cambridge's Bright rises with Enfield's Lewis for the ball loops up off one or the other, Marlborough behind them sees it safely into her gloves. Free kicks are being given away regularly and more decisions are going against Enfield much to the frustration of their bench, most on the half way line. Bright sends the next one into the face of the area, inside the D, Nuttall gets a firm header on the ball directs it curling towards goal, Marlborough has plenty of time to see it coming gets across to claim. Logie then has a chance to strike from distance as Cambridge break up another Enfield move send the ball long into the striker 20 yards out, takes on the early shot is rising but heading straight for Marlborough. In the opposition goal Cambridge goalkeeper Verity Crook has had little to do, is called into action as Bassett gets hold of the ball on the left for Enfield a strong run sees Alena Beganovic making a move centrally to get into the box looks to pick her out with the pass, Crook calls for it, gets it up into her gloves just before Beganovic can pounce. On the opposite flank good foot work from Aysa Mustafa in the corner from a throw in sees her whip a cross into the box, catches Coleman at the near post by surprise, does well to get her foot on the ball but can only turn it behind for a goal kick. Logie and Hewitt combine well on the left side as Cambridge attack Hewitt racing over halfway receives the ball from Logie as the striker holds it up, spins off her marker and wants Hewitt to play the ball into space behind on the left, Hewitt sends the ball long for her to chase down then goes forwards herself getting into the box left of goal, Logie fizzes the cross into her, is a good control and take down from Hewitt, the shot doesn't come off snatches the ball wide. Logie goes after the ball played in behind on the left once again, has Nuttall getting up to support, plays the ball into her feet inside the box, Nuttall swivels on the ball looking to send the cross through the six yard box, Marlborough gets down and throwing an arm out makes a vital save late in the half to push the ball away, had she not done so, Goodchild would have walked the ball into the net. Goalless at the break, no doubt Marlborough has been the busier of the 2 goalkeepers, Cambridge have the better chances to open the scoring. A competitive match, but then I'm told it always is. Enfield's build up play is being disrupted by the number of free kicks that are going against them in the middle, but that is only firing them up. Cambridge get the 2nd 45 underway, looking to go left, Enfield's Beth Demery puts in a great tackle to win the ball, play it into the middle, Lewis then puts the ball out to Coleman on the left, she puts the early cross along the face of the box for Bassett, in space 20 yards out opens up her body to put her foot through the ball meets it perfectly the ball angling away heading for the top corner, Crook responds throwing herself up and back to tip the ball over and around the post, the resulting corner comes to nothing. Hewitt looks to play the ball over the top for Logie as she breaks on the half way line, Ford is an experienced defender reading the ball has given herself a couple of yards on the striker to get into position to throw a leg out take the ball from her as she looks to control for a shot. Nuttall wanting the ball put out to her on the right wins Cambridge a corner kick, takes it sending the ball into the area looking for Bright standing on the penalty spot goes beyond her, Burt is at the back of the pack breaks away after the ball retrieving looks to get into a crossing position ends up putting the ball behind for a goal kick. The game is more stretched Enfield are using the width more themselves 2nd half win a corner on the right side. The ball is sent in towards the back of the area, Nuala McKevitt gets her head on the ball sends her header wide across the face of goal. Enfield's Nuala McKevitt sends he header wide across goal. GOAL! Bassett's early shot has given Enfield a huge boost as they look to take the game to Cambridge more, Holly Brandon wins a corner of Jenkins as she attempts to get onto the end of a cross whipped in from the right side. From the corner on the left Cambridge are caught out no body tracks Coleman as she drifts from the centre of the six yard box towards the near post the delivery is good straight at her she lifts a boot and hooks the ball straight over Crook and into the back of the net 1-0. Soon after conceding Cambridge make a double change, taking off both wide players, Simmons and Hewitt, bringing on Becky Taylor who goes out to the left and Laura Baker out to the right with Nuttall put closer to Logie. Enfield's Beganovic get's her head down and runs with the ball on the right taking on her marker, cuts the cross back inside to the edge of the area with Coleman arriving, can't get the shot out from under her feet Cambridge block the ball rolls loose to McKevitt 20 yards out only one thing on her mind hit it! The Cambridge centre backs converge and block the shot. Enfield make their 1st change with Lewis the player coming off, Cally Browne coming on. Cambridge win another free kick in the middle, Crook wants to take it launches it towards the face of the Enfield box, is headed clear by Demery, Cambridge regain the ball Tahnee Perfect laying it out to Taylor on the left she looks to carry the ball into the area, Ford comes across to get on her shoulder and roll the ball out for a corner. A good delivery into the centre of the box Baker rising can't connect, Taylor tries to control the ball at the far post just won't settle before Enfield close her out. Perfect puts a good ball into Nuttall central her back to goal spreads her pass out to Baker coming in from the right, shifting the ball inside to get a yards on the defender in front of her shoots with her left foot inside the box the ball rolls into Marlborough's gloves. Ferdinand has grown into the game with Cambridge looking to pick out Baker on the right the left back stays on her defends well denying her a 2nd shooting chance as they enter the box. With Cambridge pushing forwards looking for the equaliser, Enfield are finding more space in round the back, Bassett up the right fires a good ball into Coleman in the box, tries to turn and get the shoot away, is marked closely the ball blocked. Bringing the ball out Perfect and Baker link up a 1:2 before Perfect looks to slide Logie through in the middle, Ford has kept with her again and gets her tackle right. 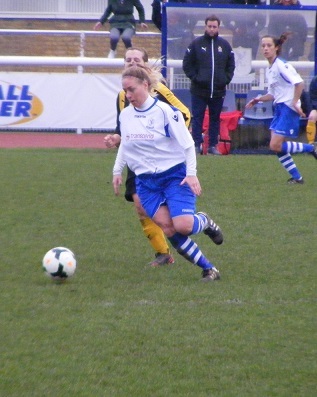 2nd change for Enfield as they bring on Sheryce Slater for Beganovic with a little under 10 minutes to play. The home side are keeping hold of the ball taking it deep into the Cambridge half, win a corner on the right, the ball whipped in towards the near post is headed wide across goal, think it was Ford with the touch as she jogs back to her defensive position. Bright trips up Coleman winning Enfield a free kick on the right, Demery to take plays the ball into the box, Bright headers clear, only as far as Demery who takes on the shot angling in towards the near post Crook palms the ball down and holds. Closing minutes of the game and Enfield with the advantage are looking to see it out run the ball in the corners and frustrate Cambridge, they bring off their goal scorer Coleman with Cara Newton coming on as the game goes into injury time, the home side see it out and after so long without a game resume with a win and 3 points. A competitive match some good battles going on Enfield were much improved 2nd half the early strike by Bassett lifting them they got their noses in front and held on to the lead. Cambridge will rue not taking one of the chances they had in the 1st half always looked like it was going to be a tight match that a single goal would settle it and it did their unbeaten run coming to an end. Tale of two halves. Nice to see a game in some sunshine, my thanks to both clubs with their help with the teams today.